SAN FRANCISCO – June 20, 2013 – Linden Lab, the makers of shared creative spaces including PatternsTM, CreatorverseTM, and dioTM, today announced that its groundbreaking 3D virtual world, Second Life®, will celebrate its tenth anniversary on June 23. Since Second Life first opened to the public in 2003, users have spent the equivalent of more than 217,266 years in the virtual world, which has seen nearly 36 million registrations to date. 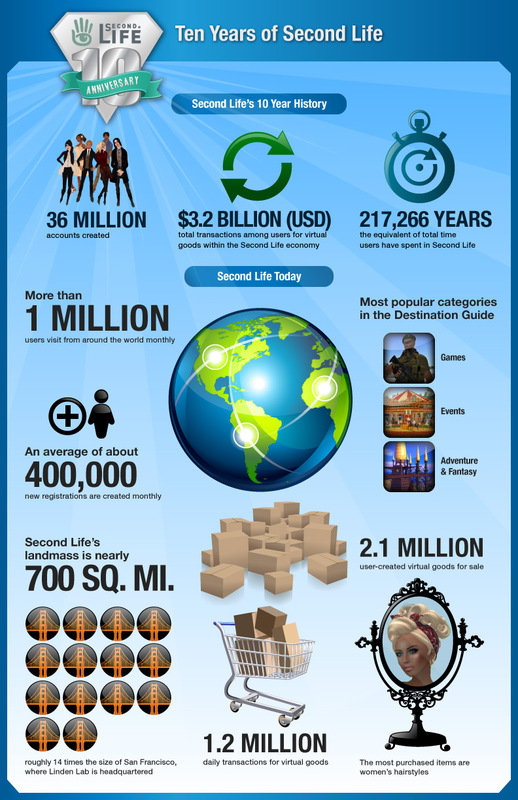 To mark the tenth anniversary, Linden Lab has published an infographic highlighting these and other facts about Second Life’s history and the current state of the virtual world, which is available here: http://lindenlab.com/releases/infographic-10-years-of-second-life. In honor of Second Life’s tenth anniversary, Humble was recently interviewed for a special episode of The Drax Files - a popular video series that profiles creative Second Life users from around the world. The episode can be seen here. Linden Lab has now expanded its portfolio to include four new digital entertainment products, including Patterns, a new 3D universe for users to shape; Creatorverse, a tablet and mobile game that allows users to set their creativity in motion; dio, a new shared creative space on the web; and Versu, an interactive fiction experience that makes the reader a part of a living story.